That’s the way the good old world used to (and is supposed to) operate. And then these kids come along and mess it up. I’m talking about brats like Chris Thile (mandolin,b. 1981) and siblings Sean (guitar, b. 1977) and Sara (fiddle, b. 1981) Watkins, aka Nickel Creek. 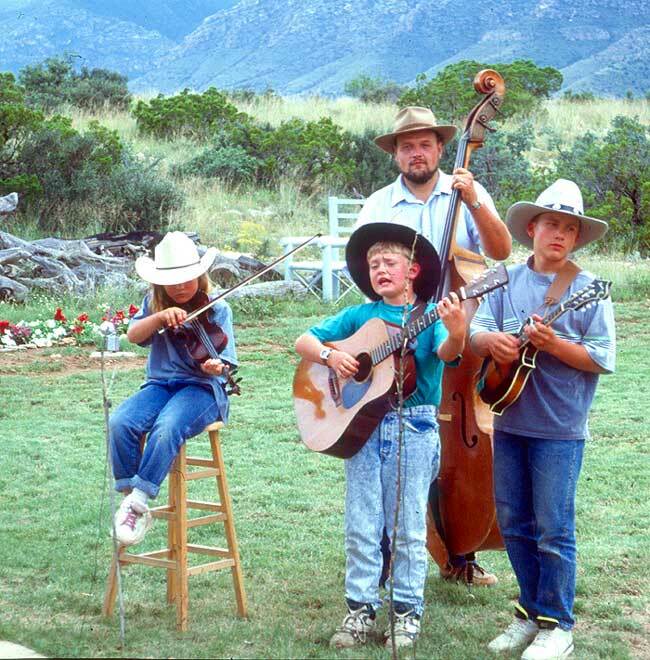 They all grew up in suburban San Diego, where their mothers had spiked their nursing bottles with a brew of blue grass. They played their first gig at a pizza parlor in 1989. Do the math—Sean was 12, Chris and Sara 8. Combined, that’s still under thirty! They were backed by Chris’s dad on bass. The three kids together couldn’t even lift the bass, let alone play it. Here they are, cute as buttons, in 1991. I know how 10 and 12 year-olds play instruments. This is clearly trick photography. When they grew up (I mean hitting 23 and 19) they were allowed to stay up late enough to record the first of their three albums for a major label. Here’s a 20-minute documentary on them from that period, including interviews with the parents, Béla Fleck, and Alison Krauss. Along the way all three recorded in solo and other group settings. Then in 2006 they put the band on ‘indefinite hiatus’. They were 29 and 25, and they were folding a commercially and artistically successful band in its prime. Something’s askew in this world. Kids that age are supposed to be graduating from college, not retiring. Musical Mark Zuckerbergs, they are. We read an article about him in Reader’s Digest, didn’t we, Ma? 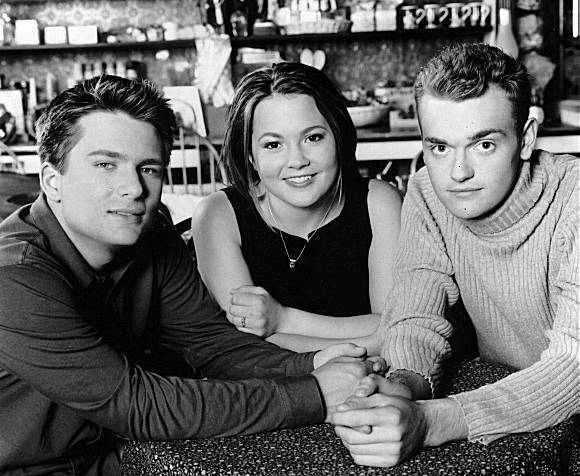 What’s worse—and my contemporaries out there, you might not want to read this – Nickel Creek is just the tip of the ice cream cone. They operate out of this genre often called Newgrass, and it’s rife with these precocious little rugrats. Let’s try to pin down some concepts here. Bluegrass is an ethnic American music, comprising one form of Country music, with Irish, Scottish and English roots, associated primarily with the Appalachians. The instrumentation is acoustic, typically banjo, mandolin, acoustic guitar, dobro, string bass, fiddle, played with a style known as ‘flat-picking’ made popular by Flatt and Scruggs and commercialized in the films “Deliverance” and later “Oh Brother Where Art Thou?”. The vocals have a “high, lonesome sound”, in 2-, 3- or 4-parts, with the upper voice typically dissonant. Bill Monroe and the Blue Grass Boys are the granddaddies of the genre. Newgrass or Progressive Bluegrass came into being around the 1990s, due to a great extent to Béla Fleck and the Flecktones. Béla is a banjoist who employs the aural palette of bluegrass infused with a jazz sensibility. It sounds just like bluegrass – till you listen to it. Then you don’t know what the hell it is. Something wholly other, something entirely new. Béla was a late bloomer. He didn’t record his first solo album till he was 21. This is in contrast to another major voice, fiddler/singer Alison Krauss who made her debut album at 16. She’s a bit more commercial than the others, witnessed by the fact that now 41, she has won 27 Grammies. And she doesn’t even use a wheelchair. So way back in 2000, when Alison was 29 (her real age, not a euphemism) and an elder stateswoman, she met Nickel Creek at a festival. They were 19 and 21 and had been performing professionally for ten years. She used her juice (that means ‘stature’; it’s a hip slang term I happen to know) to get them a contract with a major label. 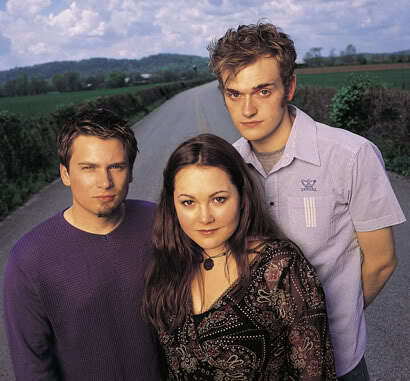 She produced their first album, the eponymous “Nickel Creek”. It was not only nominated for two Grammies, but Time Magazine named them one of the “Five Music Innovators of the Millennium”, whatever that is. The album draws heavily on traditional bluegrass, but is as chock-full of sweet surprises as a triple-scoop double-chocolate cone. Highlights include ‘Ode to a Butterfly’ (a fine clip from 1999), ‘The Fox‘, and my favorite, the religious ballad ‘The Hand Song’. 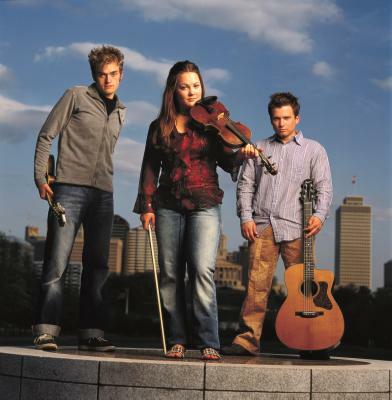 Ms Kraus also produced their second album, “This Side” (2005), which reached farther afield into the folk rock and indie worlds. Here’s the title track live, showing off their nimble fingers and ridiculously mature sensibility. Then in 2005 they upped the ante with their third album, “Why Should the Fire Die”, with many of the cuts fully crafted songs, all in all a much darker affair. Heck, they were already in their mid-twenties, they were ready for Life, weren’t they. Here’s ‘Jealous of the Moon’, a very, very fine song by any standard. Here’s ‘When In Rome’, (Where can a dead man go? A question with an answer only dead men know.) And my favorite, a misogynous delicacy that transcends all of the many genres it draws from, ‘Somebody More Like You’. These three whippersnappers aren’t stealing their country-infused acoustic guitars and tight harmonies from The Byrds and Crosby Stills & Nash. They’re their legitimate descendents, their grandchildren if you will. They’ve absorbed the traditions of the musical mindsets forged in by The Beatles in “Rubber Soul”, as well as Bill Monroe and a whole slew of elders from other lands. I was busy trying to reconcile myself to their inherently disrespectful precociousness. And then this week I discovered the mind-boggling Becca Stevens Band. Becca was born in 1988, a decade younger than these tykes. How the heck is an old geezer supposed to keep up with all this fine music? Great sotw Jeff. I like the music and particularly enjoyed your masterful usage of the confounded slang that these youngsters use today. Just one question: what the devil is Hip Slang?